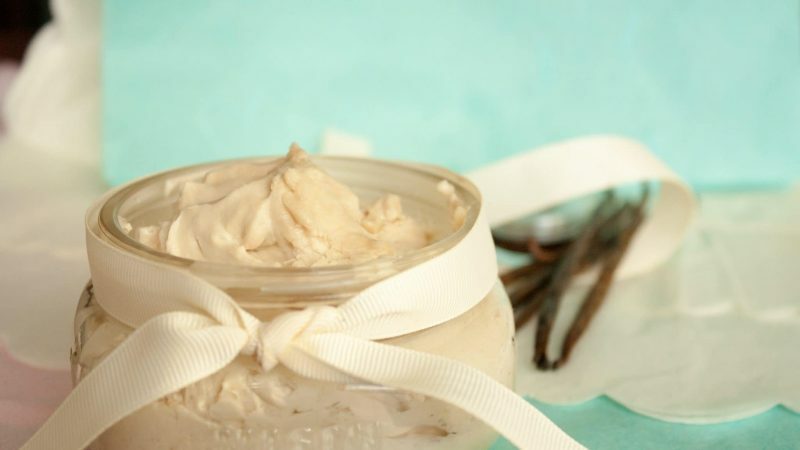 This soothing, creamy, and healthy homemade lotion will make lovely and thoughtful DIY gifts. No additives, all natural ingredients, and organic means they can enjoy guilt-free! Place the shea butter, coconut oil, and beeswax in a heat proof bowl over a double boiler saucepan. There should be enough water that it touches the bowl, but won't boil over. Melt the ingredients over medium heat. Add the apricot oil and stir to combine. Remove the bowl from the heat and stir in the Rodelle Gourmet Vanilla Extract and the Vitamin E oil. Cool the bowl on the counter, then place in the refrigerator for no less than an hour. When the solution has almost solidified, beat with an electric mixer until fluffy. Try our other DIY gift ideas for a special present idea, or just to switch up your typical habits at home: Rodelle Homemade Vanilla Bean Loofah Soap, Vanilla Bean Bath Scrub Recipe, or our Rodelle Cocoa Lip Balm!